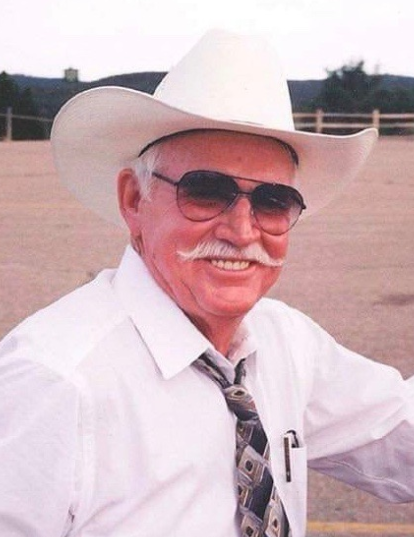 Paul Gentry passed away peacefully on Saturday, March 30, 2019 in Carlsbad, New Mexico. He was born May 24th, 1932 to Frank and Essie Irene Gentry, Carlsbad, NM. Immediately after graduating Carlsbad High School in 1949, he married Mary Etcheverry and joined his siblings and parents developing a new farming community and building a new town called Dell City, TX. He partnered with his father on a farm and feedlot operation until his father’s passing in 1966. He later developed a successful trucking and feed brokerage business, that included a partnership with Slim Pickens horse cubes. He also ran a winter cattle feed operation with partner Frank Brownfield, Dell City, TX, conditioning cattle for Southwest Feedyards, El Paso, TX and Davidson Feedyards, Pecos, TX. In 1991 he moved to Albuquerque, NM and became facility and equipment manager for United States Team Roping Championships. He held that position until 2000 when he married Sharon White and immediately started a company building alligator juniper furniture. Sharon had a party catering company and they moved their companies two times before settling in Canyon Lakes, TX, where they resided until his declining health forced him into a Carlsbad nursing facility in 2017. He was known for spoiling and entertaining all his grandchildren, great grandchildren, nieces, nephews, and really any children within range. No children road alone on the scariest amusement park rides, balloons, and all were expected to bait a hook. Uncle Paul, Papa, and affectionately “Pops” to non-family members was truly a pied piper, and lived every minute of every day. He was preceded in death by his parents, brothers, John Arthur, Alvin, and Lynn Gentry; and sisters, Alice Shelton, Nadene Barker and Mary Lou Lee. He is survived by his wife Sharon Gentry of Fort Davis, TX, his two sisters, Virgie Hale of Albuquerque and Cora McCauley of Carlsbad; son Denny (wife Connie) of Albuquerque, grandchildren, Lacee, Audra and Lucas Gentry; daughter Linda Gentry of Carlsbad, grandchildren, Deron Robinson, Kate York and Mary Janis Wilson; Lisa Franklin (Art) of Hobbs, grandchildren, Gentry Henry, Ashley Cuellar and Emily Davis. He was also loved his step children and grandchildren, Sherrie Mulanax (Cliff), grandchildren Colt and Kyleigh; Wesley White (Corey), grandchildren Madison, Kameryn, Teagan, and Keagan. Numerous great grandchildren, nieces and nephews. The Funeral Service will be held Friday, April 5th at 1:00 pm at Denton-Wood Funeral Home in Carlsbad, New Mexico.